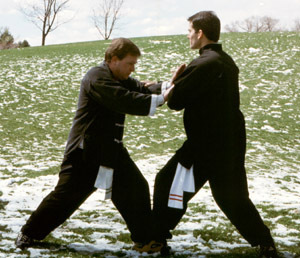 Each seminar teaches the basics of Push Hands. To avoid unnecessary problems and make all matches more efficient and enjoyable, ALL COMPETITORS must be APPROVED before competing in our TOURNAMENTS. 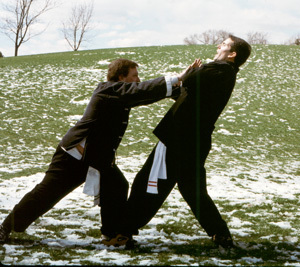 If you are experienced in Kung Fu and Push Hands, email our Tournament Director for approval BEFORE the tournament. 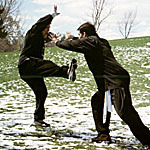 Shaolin Chi Mantis and Tai Chi Youth, utilize STATIONARY PUSH HANDS rules that only require one person to LIFT ONE FOOT OFF THE GROUND = Opponent's point. Our simple rules that rely on your Tai Chi skills of balance and flexibility have not resulted in a single injury since 1984. A dramatic contrast from the dozens of Karate tournaments I have attended and judged at which average at least 3 serious injuries per every tournament. ALL registrations include FREE JUDGING SEMINAR during the same month. If you are a Tai Chi student, come test your skills and learn some new tricks. If you are new to all martial arts, enjoy the safest way to compete with someone and learn some balance and self-defense techniques useful to anyone. If you are a Karate stylist, expand your awareness and abilities by learning Push Hands. 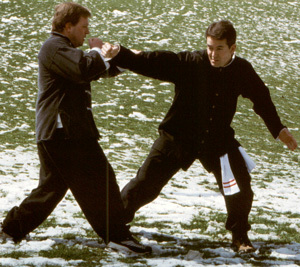 More similar to Judo, and Aikido, Tai Chi Push Hands employs the softness of water and sometimes the force of a waterfall. You'll be glad you attended. 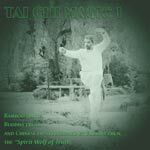 Yang Style Tai Chi of Shaolin Chi Mantis. 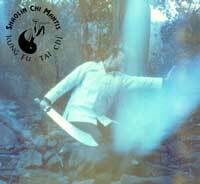 Buddha Zhen sent videos of his Yang Taijiquan Short Form all over the world in 1992 and 1993. 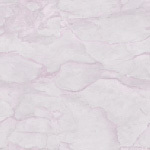 The comments and feedback were helpful and surprising. 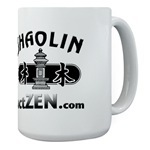 Buddha Zhen earned the nickname "Shaolin Tai Chi Master." Perhaps a couple of other schools thought this to be a criticism of our COMBAT ORIENTED style of Tai Chi. 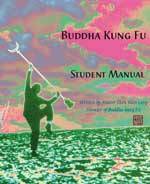 Some schools thought that Buddha Zhen had received SECRET TRANSMISSIONS from the Yang family to make our Shaolin Chi Mantis Tai Chi so powerful and combat effective. This led many schools to refer to our style of Tai Chi as "KWANGPING" or "Kwanping..."
SCM and TCY utilize Stationary Push Hands rules to develop the Tai Chi skills of our students. With no punching or kicking involved, no injuries have occurred in Shaolin Chi Mantis or Tai Chi Youth Push Hands classes or tournaments in 15 years. 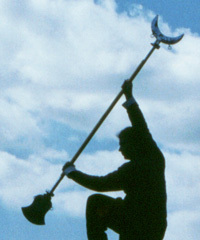 The first person to lift a foot loses a point to the opponent. The most points wins. All ages enjoy Push Hands from 5 to 65. 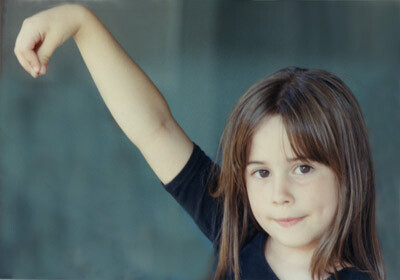 The added contact and interaction between students is also beneficial. 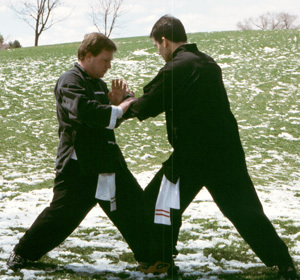 Sportsmanship, sensitivity, and compassion are all byproducts of our Tai Chi programs. This seminar will teach the basics, familiarize you with tournament rules, and start you on your new path of pushing people around--politely.